Paying bills is not a fun activity. While it isn’t fun, it is imperative that you pay your bills in full and you pay them on time. On time payment is one of the biggest factors of your credit score. Just one late payment could severely damage your credit score and cost you hundreds or thousands of dollars in the future. So, how can you make sure you always pay all of your bills on time? Today I’ll share my secrets on how I make sure I never have a late payment. The key to ensuring you’ll always be able to pay your bills, and pay them in full, is never buying anything you can’t afford. While it is tempting to splurge on something you feel like you deserve, if you can’t afford it you’ll only be punishing your future self for buying something you can’t afford today. Stick with what you can afford and paying your bills in full and on time every month will be much, much easier. This little secret, my bill tracking spreadsheet, is one of the biggest keys in making sure I never make a late payment. Whether you use a spreadsheet or just a simple piece of paper, this document will save you from forgetting to pay a bill. To build your own version, simply list every single bill you have down the left side of the page. In the next column, list when the bill is actually due. My power bill is due on the 5th of the month after I receive my statement. If the bill is a recurring amount every month, like my mortgage is, list the amount in the next column. I have one more column for notes about my bills. I use this to remind myself of special factors like when I’ll be charged an annual fee on a credit card or any other information I don’t want to forget about that bill. After I have all of this information compiled, I list out the next twelve months in the columns to the right. Whenever I make a payment, I mark paid in the box where the bill row and month column intersect. If there was no balance this month, I simply write no balance. If the bill is only once a quarter, twice a year or some other odd interval, I use the color black and fill in the intersecting rows and columns so I know I don’t have to worry about that bill that month. Here’s what an example of a bill payment spreadsheet would look like. If you’d like a copy of the excel workbook, please contact me and I’ll email it to you. Why does this work for your recurring bills? As long as you check your spreadsheet once a week, you’ll notice if a bill doesn’t come in when you’re expecting it to. It could have gotten lost in the mail or throw away by accident, but chances are you’ll still be responsible for paying the bill on time. Even with my bill tracking spreadsheet, I still pay all of my bills as soon as I receive them. Why? It is very easy to forget to pay a bill if it gets buried in a pile of paperwork or mistakenly thrown away! Why risk forgetting to pay a bill? You used to be able to make a small amount of interest by keeping your money in the bank until the bill’s due date. However, with interest rates as low as they are today, the penny or two of interest you’d earn isn’t worth it. Just pay your bills when you get them and there is a much smaller chance of forgetting to pay a bill. Want an even easier way to make sure you never forget to pay a bill? All you have to do is automate every single bill that you can. When you automate paying your bills, you’ll have less payments you have to manually make every month. You should still follow up on your automated bills to make sure they get paid, but checking up on them is much easier than going through the hassle of paying them manually. A great bank that allows you to automate many bills is Capital One 360. They will even mail checks for you automatically based on how you set your bill pay up. You can read my review about Capital One 360 here. The one downside about automatic payments is keeping up with your payment information. I always use credit cards for my automatic payments whenever possible, but credit cards have expiration dates! If you let you credit card information expire, your automatic payments will stop and you’ll end up with at least one late payment if you aren’t paying attention. Make sure you have a list of all of your automatic payments on each credit card or bank account you have. Then, whenever you get a new credit card, whether it’s because the old one expired or you had fraudulent activity on your credit card, simply pull out the list and update all of your bills with your new credit card or bank information. Whether you make automatic or manual payments on your bills, it is absolutely imperative that you get a confirmation of your payment. Why is this so important? Without confirmation, you bill may not actually have been paid! This has happened to me once before and it resulted in my only late payment I have ever made. Luckily, it was on my electric bill and I was only 3 days late. The power company wasn’t worried at all because they had much worse offenders as customers. Even so, I never want to make another late payment again, so I always check for my payment confirmations after I make a payment now. My last tip is actually one of the most important tips when it comes to paying your bills. Whether you automate your bill payments or pay them manually, you must ALWAYS check your statements for errors or price increases. I’ve caught countless price increases and errors on my billing statements. Once I notice the error or price increase, I simply call the company and ask for the price to be reduced to my old price or I ask them to correct the error. Over the few years I’ve been doing this I’ve easily saved thousands of dollars. Just because you automate the payment of your bills doesn’t mean you should never look at them again. Keep an eye out for errors and price increases so you can save yourself money or decide when it’s time to quit using a newly overpriced service. If you commit to following these 7 simple tips on a regular basis, there is a good chance that you’ll never make a late payment again. 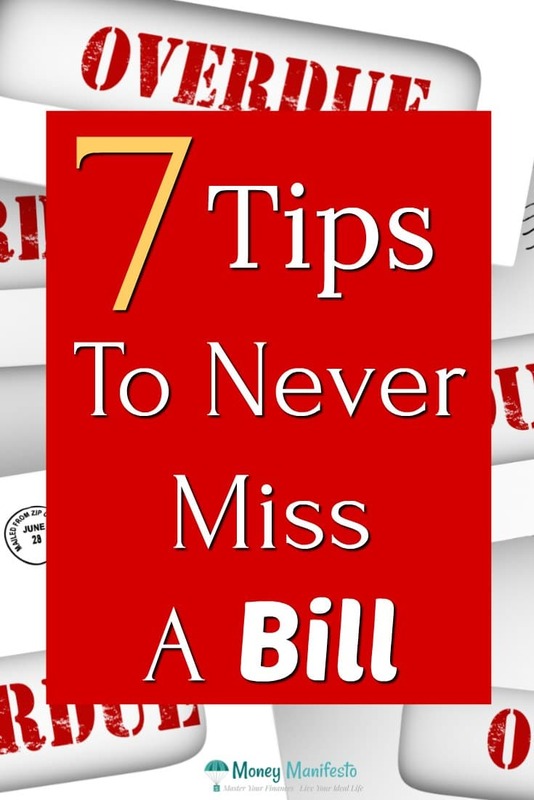 However, if you slip up on just one of these steps a bill could slip through the cracks! Late payments can severely impact your credit score. That damage could cost you thousands or tens of thousands of dollars on something as simple as a home mortgage. Don’t fall victim to a late payment. Get your system working for you today! How do you make sure you never pay a bill late? Do you have any other tips or tricks you’d like to share? I’d love to hear them! When interest rates were better, I’d wait until about 5 days before the due date to make payment. That way I’d squeeze a penny or two more interest out of my interest bearing checking account. Now, however, with rates so miserly, I pay the bill as soon as it arrives. Totally agree. I did the same when interest rates were 3-5%, but now that they’re 1% it isn’t worth it. May not have even been worth it back then! Every time I made a payment for my debt, I also mark the date. And I also set an alarm a week before I need to pay.